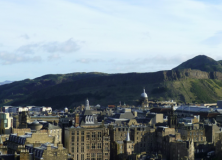 The University of Edinburgh are offering a Chancellor’s fellowship and are keen to attract applicants particularly in the area of language evolution. The position is a 5 year post doc that is expected to result in a permanent position. More details are available here, including Chancellor’s fellowships in other areas of linguistics. There’s been much anxiety about opportunities for early career researchers, but the last two years have seen a bumper crop of jobs in cultural evolution, including projects in Reading, St. Andrews, Tübingen, Rome and ANU Canberra. The future’s bright!